"I always try to push myself to do something new for him," she said. Based on the best-selling YA book by Ransom Riggs, the movie follows present-day Florida misfit, Jake (Asa Butterfield) as he travels to Wales in search of closure (and clues) in the mysterious death of his grandfather, Abe (Terence Stamp). While abroad, Jake discovers an orphanage full of "peculiar" children overseen by the pipe-smoking Miss Peregrine (Eva Green), an alt-Mary Poppins who doesn&apos;t need an umbrella to fly because she&apos;s also a bird. But more importantly, she can manipulate time; thus, the kids continuously relive one looped day in 1943 for reasons involving Nazis and aforementioned monsters with an appetite for fresh eyeballs. For initial inspiration to dress the &apos;40s-dwelling Peculiars, who only wear one look for the duration of the film, Atwood looked to the pages of the "Miss Peregrine" book, which is full of vintage "odd photographs" that the author collected from flea markets and swap meets. Then, while staying (mostly) true to the 1940s silhouettes, she infused each custom-made costume with elements and qualities of the power signature to each Peculiar. But for Miss Peregrine, who majestically transforms into a midnight blue falcon at will, Atwood didn&apos;t want to go too literal with the avian interpretation. "So I did a little point at the back of her jacket and a peplum on her skirt, so it had a likeness like wings to it," explained Atwood, after an early screening of the movie. In homage to the Victorian orphanage house, she mixed in late-1800s detail with an "inverted pleat shoulder." 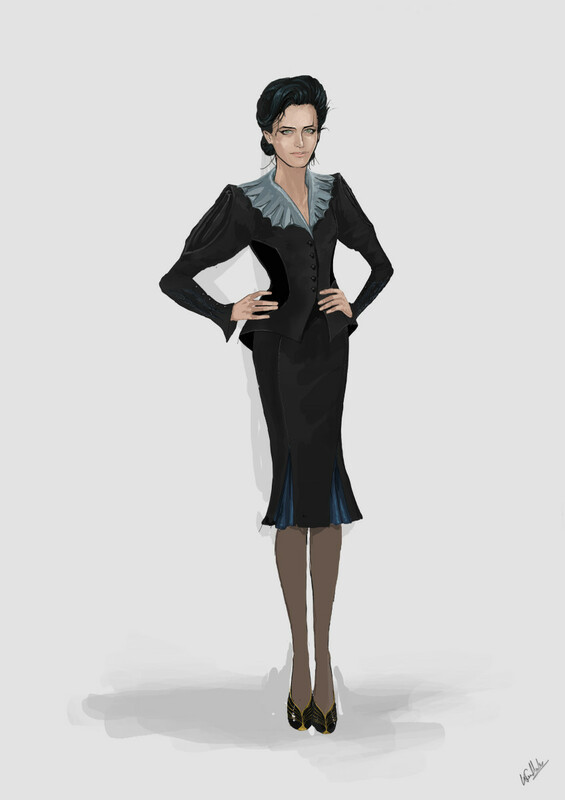 While eschewing black — but matching the feather-y blue streaks in Miss Peregrine&apos;s swoopy up-do — Atwood opted for a dark-navy wool crepe for the suiting, and added a little sartorial Easter egg. We see it! 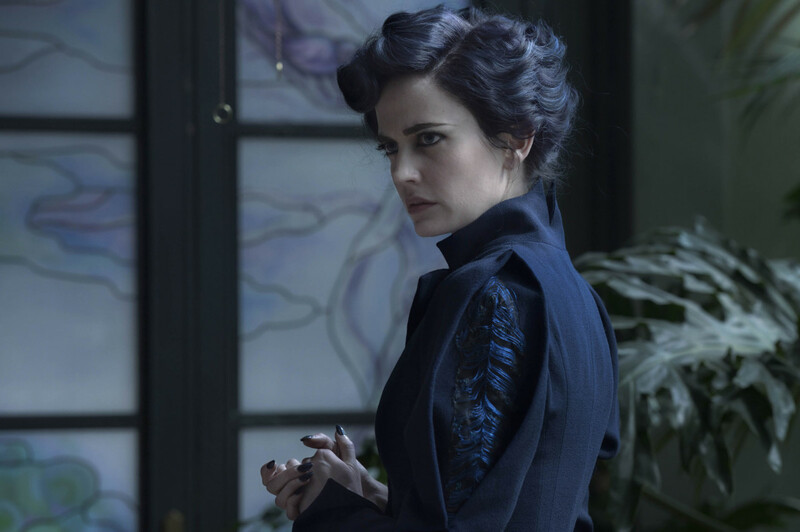 Miss Peregrine (Eva Green). Photo: Jay Maidment. "I did a metallic and embroidered silk feature on the insert of the sleeve, so when she moved you kind of got a little glimpse of it," Atwood said with a smile. "You can&apos;t really tell it&apos;s a feather because it&apos;s pretty much hidden, but we knew it was there. So it was kind of for us." While romantic beauty Emma (Ella Purnell) can manipulate air, she can&apos;t control her penchant for floating up into the stratosphere. So she literally stays grounded with a pair of ornate, heavy metal creeper boots, which bring Alexander Wang fall 2015 to mind. "In my mind her father made the shoes for her out of an iron and added things to them to give them a sort of reality," Atwood said. Instead of the expected buckles, she designed ski boot-like clasps, instead, to avoid a "really steam-punky and done-before" aesthetic. 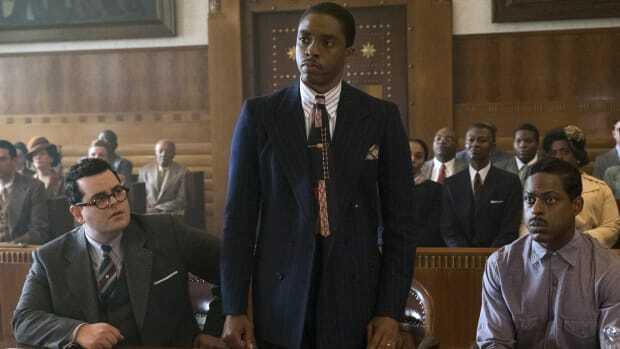 The boots were also made in different weights, depending on what Purnell&apos;s scene entailed. "Then you had to go okay, &apos;remember they&apos;re heavy though, right?&apos; Don&apos;t take off like you&apos;re in sneakers all of a sudden," laughs Atwood. 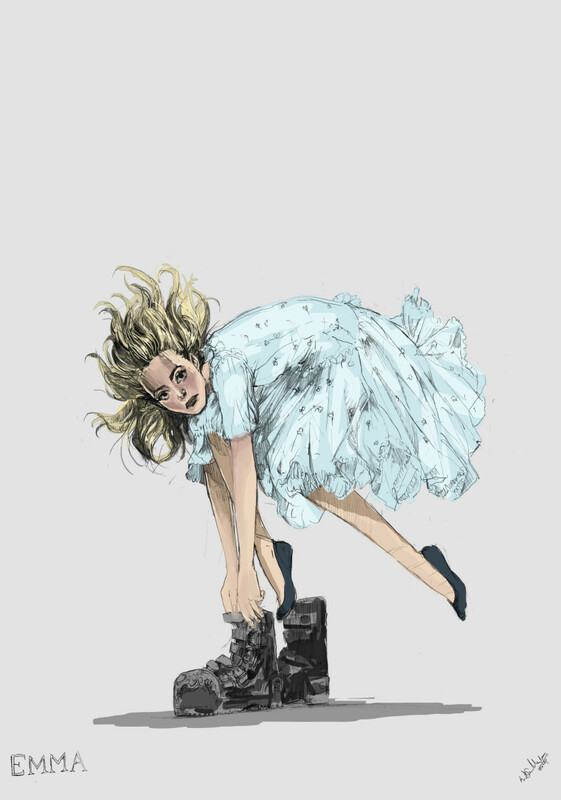 The heavy, thick-soled boots counterbalanced Emma&apos;s ethereal blue dress, which conveyed her lighter-than-air powers. "I knew she was going to be floating a lot, so I wanted the dress to have a cloud-like feel," the costume designer said. Made with a few layers of light silk, the dress had 12 multiples to account for harness work, stunts and doubles. 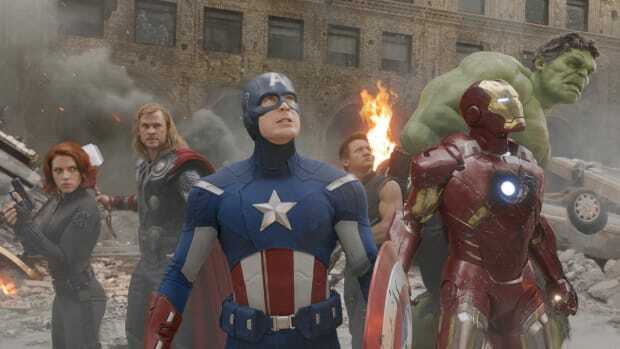 While some versions had small weights sewn into the hemline to avoid wardrobe malfunctions during the floating scenes, Atwood had another safeguard in place. "I made sure everybody had big underpants, just in case," she laughed. Accidental (and sometimes intentional) arsonist Olive (Lauren McCrostie) wears over-the-elbow black gloves to control her gift of lighting fire to anything she touches. Atwood played with latex and different lengths, but settled on a structured patent leather. "I wanted it to be shiny and look like it could hold the fire," she said. 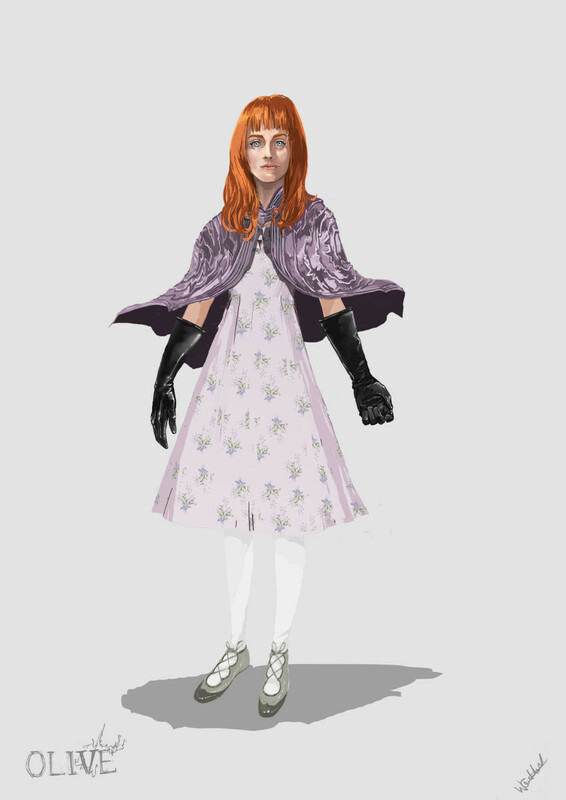 Atwood designed an orchid-printed lilac print dress to complement Olive&apos;s flame-red hair. "She was a little bit old lady in a young lady&apos;s body, so I put ruffles and more fussy details on her costume," the costume designer added. And those masked, mute twins straight out of your nightmares? Their peculiarity is a surprise, but — hint — they wear the mime-like headpieces for a reason. Atwood didn&apos;t want to go with a "mummy"-like bandage effect, so she reached into her own stash to create costumes that would make for a terrifying couple look come Halloween. "[The masks were] made out of an old piece of handwoven wool that I bought years ago in Turkey and I&apos;d been hoarding it for years," she said. The twins are played by real-life twins, Thomas and Joseph Odwell, who went a bit method with the help of their face-obscuring costumes. "They liked being weird and strange and they acted very odd when they had [the masks and costumes] on," Atwood laughed. Terrifying. 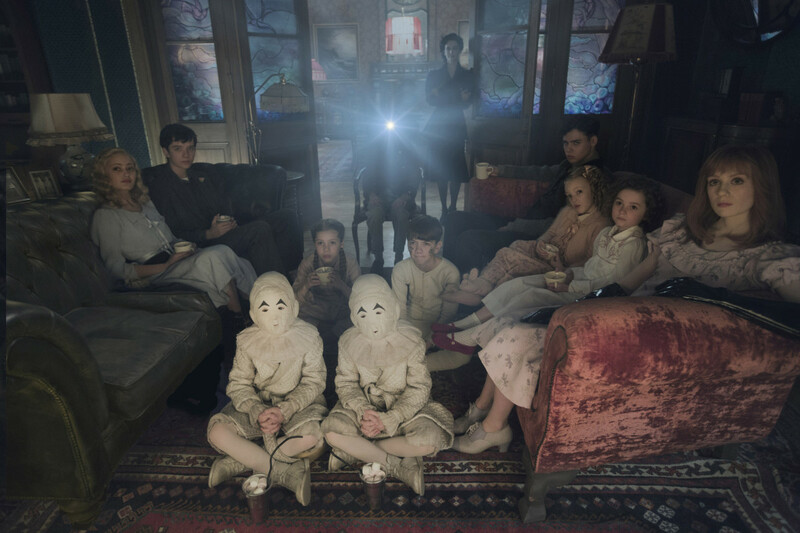 Seated on the floor: the twins (Thomas and Joseph Odwell), Fiona (Georgia Pemberton) and Hugh (Milo Parker), Left to right: Emma (Ella Purnell), Jake (Asa Butterfield), Horace (Hayden Keeler-Stone), Miss Peregrine (Eva Green), Enoch (Finlay Macmillan), Claire (Raffiella Chapman), Bronwyn (Pixie Davies) and Olive (Lauren McCrostie). Photo Credit: Leah Gallo. To keep Jake from looking completely anachronistic among his new friends at Miss Peregrine&apos;s, and to channel his connection to his grandfather, Atwood referenced &apos;40s details and silhouettes ins Jake&apos;s modern-day look. "I was trying to tie him together with Abe in the sense that [Jake] wears vintage shirts like his grandfather does in the flashback," she explained. "It&apos;s like a reincarnation. Sometimes you see kids and they don&apos;t look like their parents, but they&apos;re kind of like their grandfather or grandmother." Speaking of parents, Jake&apos;s dad Franklin definitely had his own dad-bro style with his non-ironic cargo shorts at home in Florida and cropped flood pants packed for beach treks in chilly Wales. Actor Chris O&apos;Dowd — you know, Kristin Wiig&apos;s cute Irish policeman love interest in "Bridesmaids" — gave Atwood his own sartorial take on Jake&apos;s Tommy Bahama shirt-wearing, "super nerd" dad. The costume designer admits she would have gone more "preppy" with nature-loving Franklin, but appreciated O&apos;Dowd&apos;s outsider observations on &apos;Murican casual style. "Like nature from the waist down; Florida from the waist up," she laughed. "His take on it was fresh to me and I really liked it... ," Atwood added. "After I got through being scared." Let&apos;s do this. 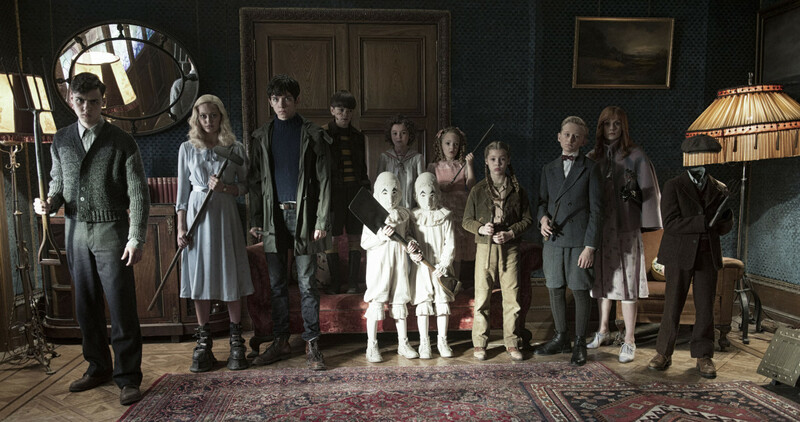 Left to right: Enoch (Finlay Macmillan), Emma (Ella Purnell), Jake (Asa Butterfield), Hugh (Milo Parker), Bronwyn (Pixie Davies), the twins (Thomas and Joseph Odwell), Claire (Raffiella Chapman), Fiona (Georgia Pemberton), Horace (Hayden Keeler-Stone), Olive (Lauren McCrostie), and Millard (Cameron King) Photo: Jay Maidment. 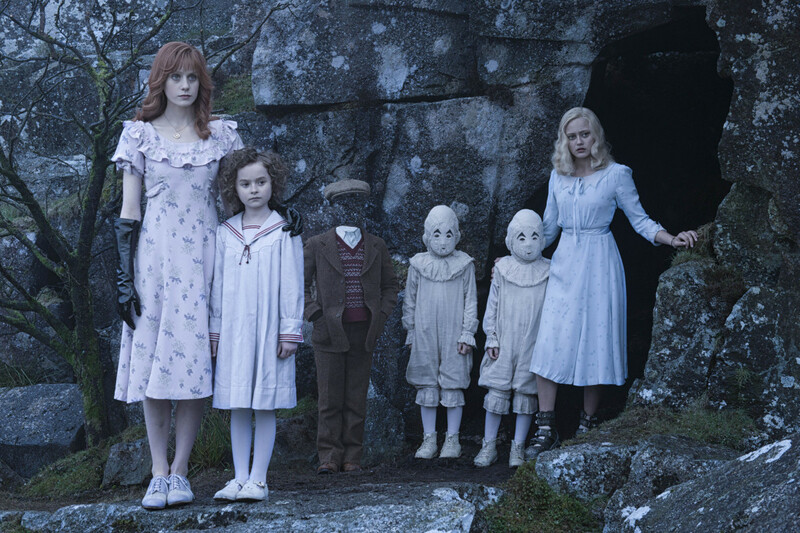 "Miss Peregrine&apos;s Home for Peculiar Children" marks Atwood&apos;s 11th outing with director Tim Burton, so they&apos;re down to a rhythm. But that doesn&apos;t mean the costume designer can sit back and rest on her laurels. "I always try to push myself to do something new for him." 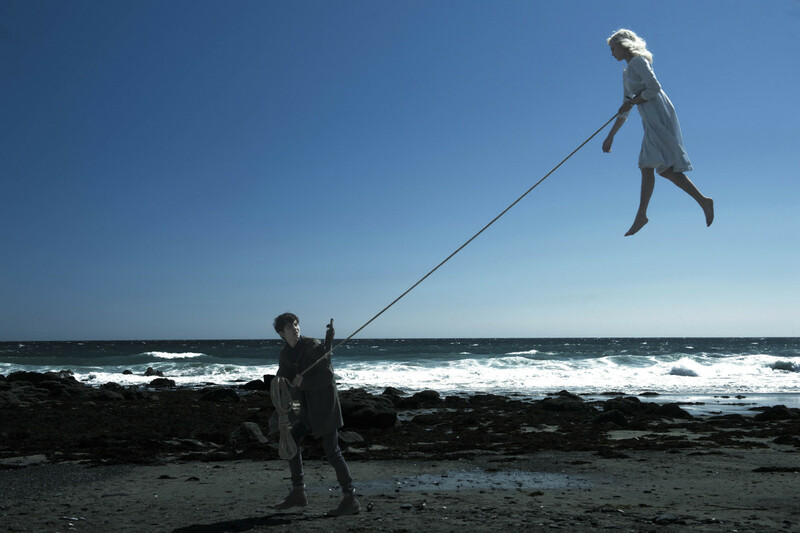 "Miss Peregrine&apos;s Home for Peculiar Children" opens on Friday, September 30. Follow Colleen Atwood on Instagram @colleenatwoodofficial. Oscar-winning costume designer Colleen Atwood takes your favorite "Harry Potter" prequel characters to the next level. 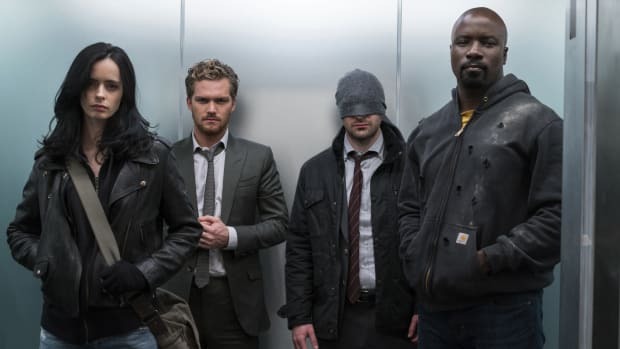 She also drops some hints on "The Defenders," including what Sigourney Weaver's outfits tell us about the new super-villain.